There are many ways for you to increase site traffic, much more of subscribers and followers to your site. And as a digital marketing agency in the Philippines or anywhere else in the world would suggest, a website is more intriguing and interested to be visited again because of the benefits your clients can get out of your website. If that were the case, then you would need strategies to improve your sign-up processes to gain more readers who will eventually become subscribers and in the long run will become your clients who should be satisfied with what you are trying to bring them. This might be an ironic thing for an individual who happens to just bump into a certain website and asks him to subscribe from a newsletter or so. It runs on a different case for businesses that strive to maintain an online presence. These companies do not only sell their products to their customers but would also give them the proper services they need from acquiring the business’ or company’s products, not mentioning the customer relations that these companies are trying to push forward to their clients. It is all about satisfying the customer’s needs and that is feeding relevant information. After all, your clients signed up because you give them valuable materials, right? 1. Let your readers know who you are, what you are doing and what they can get from you. By making this clear to them, it would be easier for you to tap into your customer’s need instinct because they know who you are and what you do. It is basically one of the key necessary things a company should let their readers know because they are from the first place, looking for you and at last they have found you! The tricky part here is making them stick around your site and subscribe. So here’s the trick: your articles and content should be enticing and full of meat. Make it to a point that they can easily grasp the idea that are within the words of your write-ups for them to get hooked up all the way down to the last letter of the article. Allow them to want some more by giving them suggested articles that are related to what they are reading and eventually, insert your sign-up plug at the end for subscription. 2. Invest in your website’s appearance. This becomes a standard for some visitors who come across your site from searching a certain keyword on Google search. Sometimes your site appearance can already say something about you. Navigation should also be at ease for your readers so it is just proper to have this appropriately focused during the developing process as well. Make it a point to include the layout of your website as to where your readers can see your content including your sign-up or subscription portion. 3. Offer newsletters, eBooks, or a product for free. Freebies always entice people. 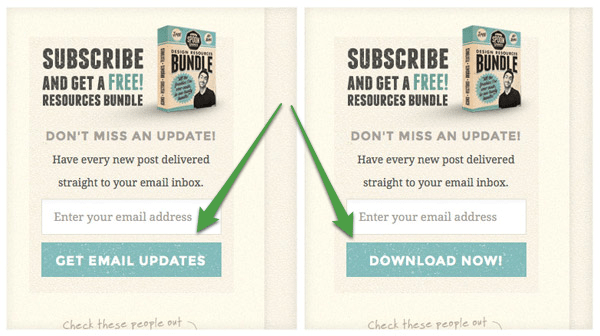 And this has always been a good tactic for websites to gain more sign-up entries or new subscribers. Newsletters are effectively distributed via e-mails so it would also do good to follow this approach in order for you to have an e-mail list that you can update your customers with the new stuff going on your website. Since these materials are published digitally, eBooks are also good deals to give out to your customers. Some readers would be rushing to grab a copy especially if it is under a limited time offer. There should be a sense of urgency as well. This works especially if your material is really good and has been acclaimed to numerous good reviews. 4. Use pop-ups or hover ads. Sometimes, website designers call it lightbox pop-ups since it appears in your screen with the page underneath it being faded or grayed out in order for it to be noticed and read. An example of which is this. Pop-ups are good attention grabbers because they are windows that can appear anywhere in the site with some information written in it. 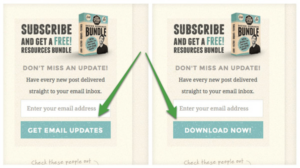 Of course, by having these pop-ups, your written content should also grab their attention, let’s say an offer that they should not be missed, is an example make-or-break call to action. Hover ads are information placed on top of your site, where your visitors or customers can read. You can place an ad there pertaining to an update regarding your product. Make sure that the statement placed on your hover ad is not as distracting as it should be. A simple statement but with a very powerful impact can move mountains. And this can apply to the words you use in attracting readers. An example of which is a site testing that gives away a free downloadable gift to every subscriber. Instead of using the words “Get e-mail updates”, it used “Download now!” button, which was indeed a good move to increase subscription. The number of subscribers rose 3x than the standard “get e-mail updates” button. This only means that it is more encouraged to use appropriately enticing words to attract your readers’ eyes and attention. This may also spark interest because of the freebie or whatever gains they can get from it. 6. Linking your websites with your social media accounts. This might be one of the best things one can increase website followers and subscribers by linking your website with your social media account. And with the mobile app development rising, you can also have an access to these through your smartphones. Allowing your users to see that you are alive on these social media websites would make it easier for them to track you and your updated posts. And with the help of using these social media accounts as subscription sign-ups that would automatically connect their Facebook or Twitter accounts to your site, it would be easier for your side to feed them with proper and decent information. Among the other steps in order to obtain an increase to your subscription and followers is to take note being more personal in keeping in touch with your clients and readers. Not because they signed up for you, means leaving them hanging just because you have a quantity of followers to maintain. It is your obligation to live up to their expectations and continue being an information giver that would send out news updates that would satisfy your customers’ needs. After all, they have subscribed to your site because they know that you can help them and enrich them with the knowledge that they need in whatever aspect they are in.